needle book: Mary Poppins doll at last! 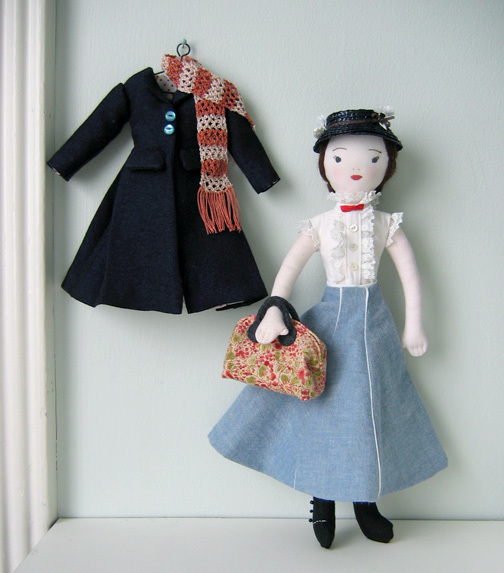 Mary Poppins doll at last! 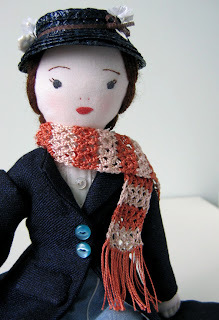 I've finally finished the Mary Poppins doll. Well except for the umbrella... I'm still thinking about that. Don't worry, I do know it's important. Of course I made a few changes, so I will show you the details. From the top, I absolutely love how her hat turned out. 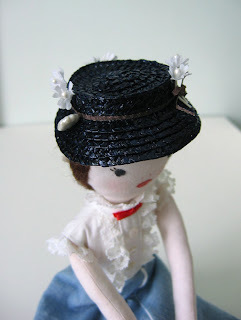 The pattern has a hat sewn from felt but I had the notion that I would like to make a straw hat for her. Then one afternoon I just happened to be in a dollhouse shop in Cambridge (as part of a birthday treat day trip that included my favourite flea markets). And I found a tiny packet that had very dark navy blue miniature hat straw braid. There was only one colour, only one size and it was absolutely perfect. So I looked it up online and sewing up a straw hat is pretty simple in the end. You can look it up yourself and find a tutorial that suits you, but the main tip, the thing I didn't know before, is that straw hat braid has a thread inside it that you can pull so that it curves. The hat band is a tiny brown scalloped trim that was described in the dollhouse shop as "fairy lace". Now how on earth could I resist that?? Then I added some tiny white flowers I had already which I trimmed to look more like daisies. The scarf was crocheted from pearl cotton with a tiny crochet hook. I matched the colours to the movie scarf rather than the pattern suggestions. That was a very finicky job that took a long time but as I often do I just worked on it while watching movies in the evening. The boots are meant to be made from felt but they just turned out too bulky. So I copied the foot pattern and sewed it from black cotton fabric, hemmed the top, then embroidered the scallop edge and added the tiny black beads for buttons. 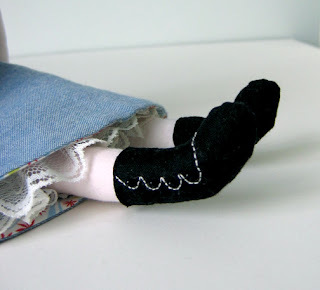 The foot for this pattern has a funny shape but it's kind of charming in a way so I kept it that way. 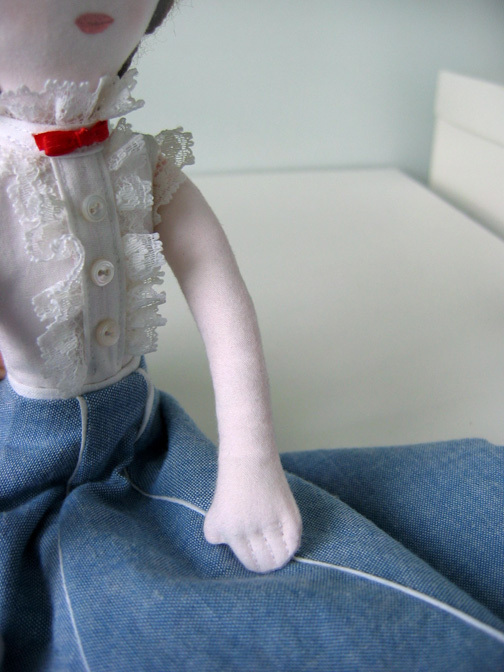 Another little change was stitching lines to make fingers on her hands. And I decided not to bother with the mittens or stockings. Lastly the carpet bag is meant to be made from blue fabric and embroidered. 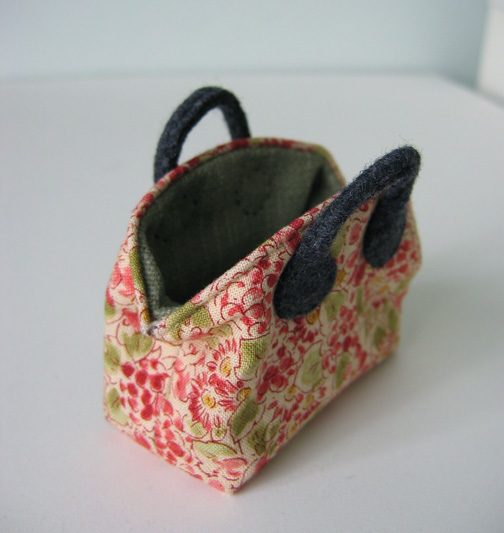 But I found the perfect little floral print at The Workroom that looks more like the carpet bag from the movie, and sewed it up from that instead. There's a bit of wire sewn in at the top which you bend down to give it that doctor's bag shape. So charming! Absolutely lovely! I love the little carpet bag! My eyes. I can't stand the cuteness! Seriously amazing work. She is just so beautiful. I love her to bits! wow. claire, this is really incredible! you've absolutely outdone yourself. she is totally a spoonful of sugar! Love her Claire! Can't wait to see the umbrella. Hi, my mom made this exact doll when I was a kid. I still have her and tracked down the pattern on ebay some years ago. So, yours has a twin! Great job! I am in love with this! I'm glad someone has made up this pattern because whenever I see it on Ebay, it goes for so much money and I think to myself that it is probably just a collector who won't appreciate making it. Oh my gosh! I too tracked down this vintage pattern years ago on ebay, and have been pondering it's making. Very inspiring! Adorable! The carpet bag is cute and I love the fabric you chose for it - it's ok that it isn't blue! Oh! I had one of those as a child! My mother made it with the help of a neighbor who was a home ec. teacher. I was so impressed by the boots that came off and the coat that came off. I don't know what happend to it. I wish I'd appreciated it more when I had it. She's BEYOND amazing! Where did you find the pattern? I'd love to make one for my children! wow, you are unbelievably talented! Wow... she's gorgeous. You did an amazing job. Practically perfect in every way. Really lovey! OMG!!! I had a doll very similar to this as a small girl in the 70s. She's been misplaced. Her bag was a bit different , as were her coat and boots. Same skirt, shirt, scarf, and fave. I have always missed her. Her skirt was also reversible. Thank you for sharing such an amazing doll! I love it. Pattern? Love this! My mom made one when I was young, but I don't know what happened to it....I would LOVE, LOVE, LOVE to make one for my grand daughter! Thank you! This is a vintage Mary Poppins doll pattern, McCall's 7432. You should be able to find it on Etsy or Ebay. Simply love it! The bag is so so so cute!!! I just got this pattern to make so I can attempt to make it for my niece. 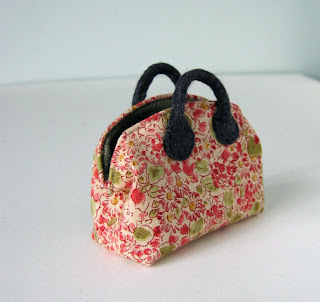 I'm attempting this with very little sewing knowledge. I hope i don't mess up. Any tips? You're turned out so adorable. I can only hope mine comes out that good. I would love the crochet pattern u used for the scarf. Please get back to me my email is wilsonmegan11@yahoo.com hope to hear from u soon.